Balancing the annual rite of passage to eat clean and healthy that New Year's resolutions bring with the desire to eat comforting, rich foods during winter's coldest days might be the great dichotomy of modern humanity. At least for Upstaters. What should one do, for instance, when the temperature dips below freezing (well below), a head cold has taken over, and the desire to indulge and self-soothe with a gluttonous delight contradicts all the abstention from fatty, sweet, and carb-loaded food that winter cuisine is known for? You order the rice chicken soup from Chontong Thai in Delmar, that's what. 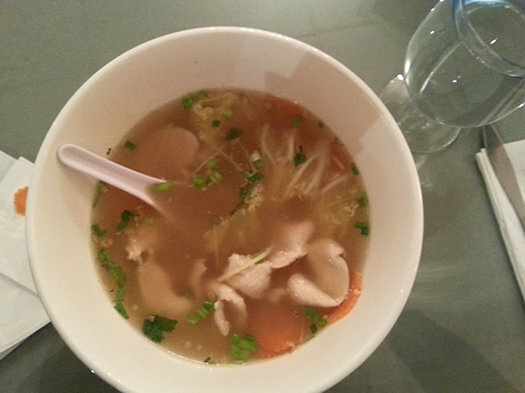 Soup -- especially chicken soup -- has been a magic elixir for generations of people across the globe. This Thai-inspired soup is no different. A crystalline broth appears innocuous at first, but one sip of this potent liquid will fix you fast. Sliver-thin carrot slices are joined by crisp-tender leaves of savoy cabbage, minced cilantro, and matchsticks of fresh ginger for a snappy flavor that enlivens the senses. Garlic is palpable but doesn't overwhelm, while black pepper provides heat and bite that will clear out your sinuses in a jiff. Rings of scallion are colorful buoys that help to brighten the soup -- both in flavor and appearance. White rice sinks to the bottom of the bowl, and you'll have to dig deep to retrieve it. The chicken that gives the soup its name and healthy vigor (chicken bones used in the broth provide collagen, vitamins and minerals) is tender yet exceedingly large for soup, each piece tending to be bigger than the spoon. Still, the sum of this soup is greater than its parts. In a word: Reviving. It's cathartic in the way it purges the winter blues from your body. It warms you from the inside out without offsetting all the healthy eating you prioritized for 2016. It feels good to slurp it, as though you were doing your body -- and soul -- a favor for any hedonistic tendency you might have endured through the final weeks of 2015. 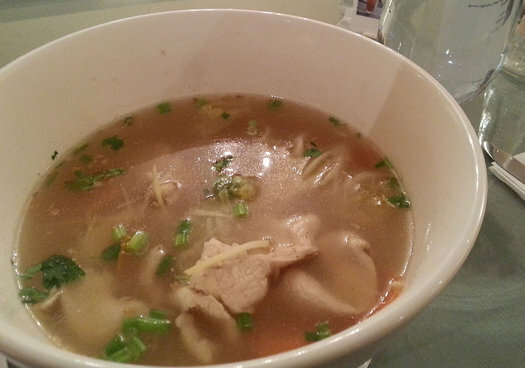 A bowl of soup will run you $10 at Chontong Thai, and that Jackson Hamilton goes far. The bowl itself is enormous -- more akin to a large soup tureen than an average crock or bowl -- and lasted me three meals. Whereas whiskey toddies will fortify you for winter, this soup will invigorate the dormant or ailing parts of you that are caused by chilly temperatures, snow, ice, and wintertime colds. Your mom was right, soup will cure you, and this soup has all the best stuff to help you survive winter and all that comes with it. I'm happy to see this place get some well deserved praise. I work nearby and eat lunch from there fairly regularly. Their lunch prices are great and I think their food is much more flavorful and delicious than any Thai place I've eaten at in the area. I'm always telling friends to try it.